(Natural News) Acne is the most commonly treated skin condition to date, per the American Academy of Dermatology. It’s more of an annoyance than a serious disorder, but having a severe case of acne may cause emotional stress and may eventually affect an individual’s self-esteem. Acne usually manifests on a person’s face, shoulders, and upper back. An inflammatory skin condition, it is characterized by pimples, blackheads, and whiteheads. Contrary to popular belief, a person doesn’t develop acne because they have poor hygiene. Acne is the result of overactive oil glands that cause sticky pores, which traps bacteria inside the skin. 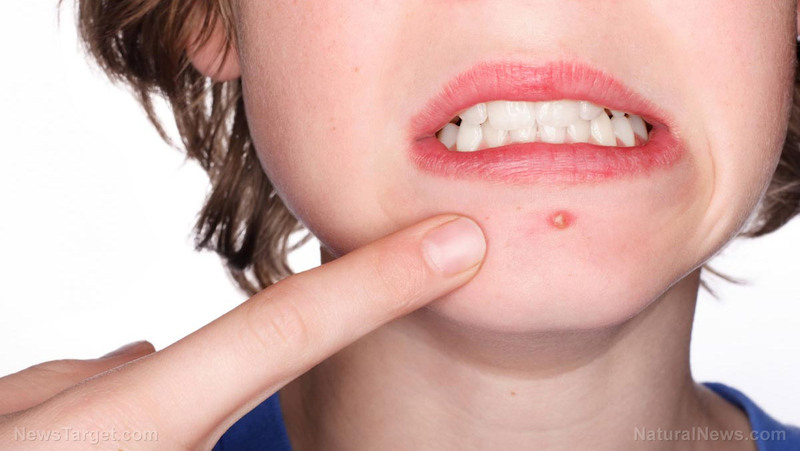 The bacteria then causes the formation of pimples. Hormonal changes can cause overactive oil glands, and these changes may occur during adolescence or during a woman’s monthly cycle. Abnormal body pH (e.g., too acidic or too alkaline) – “Potential hydrogen,” or “pH” is the term used to describe the acid-alkaline ratio of a substance. This ratio can range from 0 (the most acidic) to 14 (the most alkaline). The health of your body and skin is connected to “maintaining the right balance between acidity and alkalinity.” If your body pH is too acidic or too alkaline, this can aggravate your acne. When it comes to acne, prevention is better than a cure. If you want to have healthy, glowing skin, you need to take care of your body. The cures listed below can help improve your overall health, which can be the key to treating acne as well. Acidophilus (Lactobacillus acidophilus) – An acidophilus supplement will provide your body with “good” bacteria that can help minimize outbreaks. Antioxidant vitamins – Taking antioxidant vitamins daily can help strengthen your immune system. Take at least 99 milligrams (mg) of zinc daily. This is the recommended dose to help prevent zinc deficiency, which is linked to acne conditions. Calendula – Calendula is an herb that has soothing properties which can soothe inflamed skin. Using natural skin care products with calendula and washing the skin with cooled tea made from calendula flowers can help minimize inflammation. Colloidal silver – Colloidal silver functions as a natural antibiotic. It can be taken orally or applied directly to the affected area with cotton. Fish oil capsules – Fish oil capsules contain gamma-Linolenic acid that can help your skin stay soft and smooth. Meanwhile, omega-3 fatty acids can heal and repair skin tissues. Omega-3s can also help dissolve deposits that block the pores in your skin. Garlic – Take two capsules of garlic thrice daily with meals to eliminate bacteria and strengthen immune function. Aside from taking supplements, you can also make some dietary changes to help treat acne. Some foods are high in fat and iodine. Avoid or limit your intake of these foods to lower your chance of developing acne. Consume foods rich in fiber to cleanse your colon and eliminate the toxins in your body. Fiber-rich foods that also have zinc include raw nuts, sunflower seeds, and whole grains. Eat more raw foods, such as almonds, beets, and cashews. Try some of the natural remedies listed above and make some of the necessary dietary changes so you can have healthier and smoother skin. You can read more articles about natural skin care products and cures for acne at Cosmetics.news.